It is my great pleasure to introduce Claire Youmans as Writing About Writing's first regular guest blogger. Claire Youmans has published several books and written more than that. She's sailed oceans, owned horses and is currently ensconced in the Southern California mountains where she is writing, skiing, and messing about with boats. She's originally from Seattle but prefers snow and sun to rain. 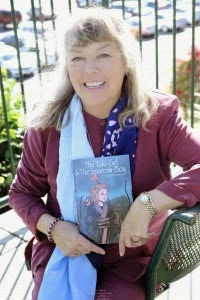 She travels extensively in Japan, and elsewhere, and is thoroughly enjoying writing The Toki-Girl and the Sparrow-Boy series of children's books, for 4th grade and up. Why Should I Give it Away? *Please note: I pay all my regular guest bloggers what their traffic brings in, even if it's only a few cents, however that only accounts for ad revenue. If you want part of your donation to Writing About Writing to be earmarked Claire, please make a note of that in the space that Paypal (to the left and top) gives you for notes, and I will make sure she gets it.